This seed storage system is comprised of a clear 16-ounce jar with a wide mouth lid that fits tightly. It comes with a silica gel 5-gram desiccant packet in the jar to absorb any moisture. 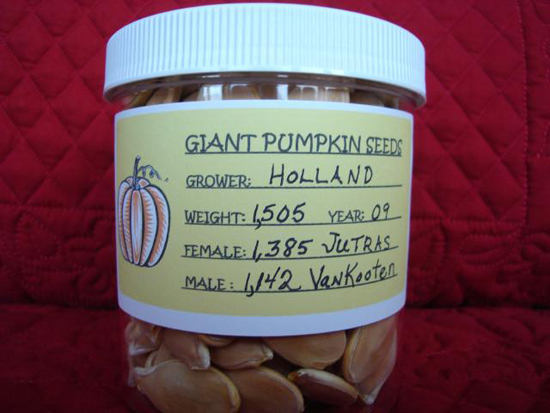 The jar holds 175-200 seeds and has a handy label where you can record the growers name, the weight of the pumpkin the seeds came from, the year the pumpkin was grown, and the female and male parents. The filled jar can be stored in a refrigerator. I have been using this system for many years and have sprouted seeds after 10 years with excellent vigor.